You are doing a full-scale, rip-down remodel of your kitchen where everything comes out and gets replaced: walls, cabinets, flooring, appliances. After the demo, it is time to put in new flooring and cabinets. But which one should be installed first: cabinets or flooring? In most cases, given standard flooring heights, you can install the cabinets before the floor covering. Floor covering, or finish flooring, is the surface that you see and walk on, not the sub-floor and not an underlayment. Floor covering will be cut to size and almost butted against the cabinets. A minimal gap should be left between the flooring and the cabinets. This gap will be covered by baseboard or shoe molding that is nailed to the bottom of the base cabinets. If total flooring height will be higher than normal – two inches or more – you may want to consider installing flooring before putting in the kitchen cabinets and appliances. Here are some reasons why. If you were to first install those base cabinets and appliances straight onto the subfloor, and then the hardwood flooring around the cabinets/appliances, the height of the cabinets and appliances will be all wrong. The work surface of your countertops should eventually arrive at 36 inches high. One way to correct this would be to put plywood risers underneath the cabinets and appliances. But what better risers than the floor covering itself? Factors that drive the choice to put in kitchen base cabinets before the floor covering. If you wish to save money, consider that all of that nicely finished hardwood flooring underneath the cabinets is wasted, at least in a visual sense. It may serve structurally, as a type of riser, but why pay top dollar for exotic hardwood that no one will ever see? 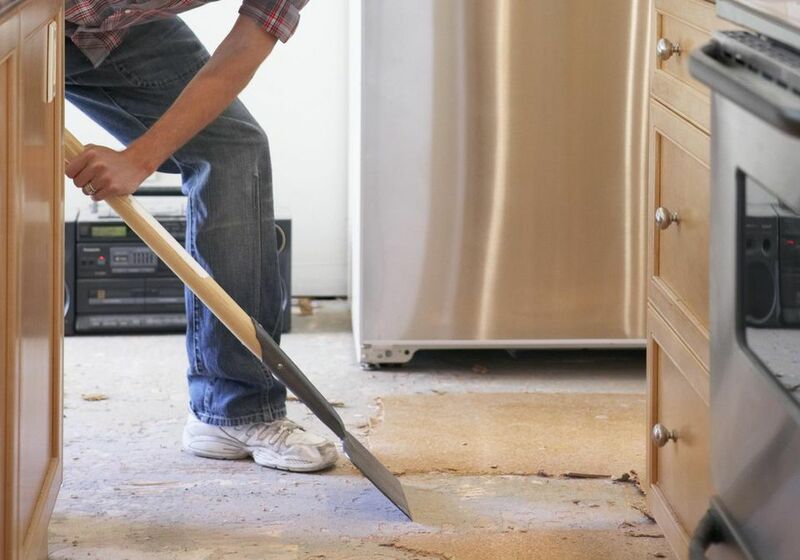 While it is not common practice to install a different, cheaper type of flooring underneath cabinets/appliances, or even those plywood risers mentioned earlier, it can be done. One downside of installing risers or different flooring is that you add a complication if you wish to change the kitchen footprint in the future. Those materials would have to be changed out for flooring that matches the rest of the kitchen. Sometimes it is not necessary to remove the existing cabinets/appliances because they are in acceptable condition. Yet the flooring still needs to be replaced. Laying the finish flooring straight onto the subfloor with no additional underlayment. This additional underlayment, by itself, would add another 1/4 inch to 1/2 inch to the total flooring thickness. Is There a Danger in Installing Floor Covering Before Painting? One off-shoot of this question is whether one should paint the home interior before installing flooring or the other way around. The occasional paint drip on pre-finished wood flooring, while no fun, can be peeled off with a fingernail. Dripping paint on carpeting, or flooring that is more plausible in kitchens such as textured or linen-look porcelain tile, can be disastrous. And even that manageable paint drip on pre-finished wood will be difficult if it lands in a seam or if the paint pigment remains on the wood. In this case, the answer can go either way. It is impossible to get paint on your finished flooring if it hasn't been installed yet. As a do-it-yourself painter, you can really let loose when you don't have to worry about a mess. Rather than taking the careful approach of working with a roller and brush, you can use a spray painter. Spray painters work faster but get paint on everything that isn't covered. But it's not always possible to choreograph painting and flooring in this sequence. If the finish flooring is already installed, a good supply of dropcloths and a healthy respect for gravity's effect on wet paint should ensure that your house stays clean. If professional painters insisted on only painting prior to installation of the floor covering, they would never get jobs. They do this all the time, and the ones who get repeat business do it spotlessly. Short answer: for all but the most precise DIY house painters, there definitely is a danger in putting in floor covering before painting.